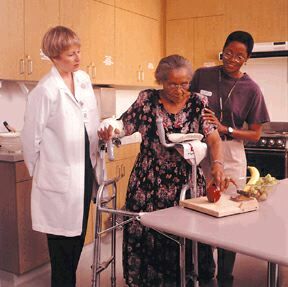 USC occupational therapist Julie McLaughlin-Gray, left, instructs a Los Angeles-area senior in the use of a safety-enhanced cutting board to help her client maintain her independence at home. To the right is occupational therapy master’s student Lynn Johnson. Occupational therapy (OT) can make a significant difference in helping seniors to experience healthier, more independent and satisfying lives, according to a recent study by researchers on the Health Sciences Campus. The study, called the “Well Elderly Study,” appears in the Oct. 22-29 issue of the Journal of the American Medical Association and marks the first time an occupational therapy study has been published by the well-known medical journal. The study represents the largest study to date in the field of occupational therapy and the first major research on the treatment benefits of OT in preventing illness and disability. Professor Florence Clark, the study’s lead author, discussed the article last week at an American Medical Association Science Reporters Conference in Washington, D.C. Clark is chair of the USC department of occupational science and occupational therapy. The Well Elderly team cut across discipline lines and included faculty and researchers from occupational science; the department of preventive medicine and the division of geriatric medicine in the School of Medicine; and the department of pharmaceutical economics and policy in the School of Pharmacy. The researchers studied 361 seniors, ages 60-89, who lived independently in the Los Angeles area. One-third of the seniors received nine months of occupational therapy, one-third engaged in non-professionally led activity groups and one-third remained untreated. At the start and end of the project, each senior was assessed for physical health, mental and social functioning, and satisfaction with life. In the program, members of the occupational therapy group received both individual and group treatment to help them achieve a healthy and satisfying lifestyle. The program was designed to help participants alter their ap-proach to everyday activities such as shopping, exercising and grooming in order to maximize function, productivity and vitality. The social control group went on community outings, worked on craft projects, viewed films, played games and attended dances, activities which were conducted without professional supervision and which emphasized diversion and social interaction only. No activities were conducted for the non-treatment control group. The findings indicate the seniors who received occupational therapy experienced more gains and fewer declines in many important health-related areas of their lives. Seniors in the occupational therapy groups showed up to a 14 percent advantage over their control group counterparts in positive change over a range of measures, including better physical and mental health, greater vitality, higher quality social interactions, greater life satisfaction, fewer role limitations and less bodily pain. Traditionally, occupational therapy has focused on helping those who have suffered catastrophic illness or disability, but the Well Elderly Study shows promise for utilizing occupational therapy concepts to prevent disease and maintain health in the general public. The Well Elderly Study was based on fresh insights from occupational science, a new field of inquiry spearheaded by Clark. The academic discipline of occupational science was founded at USC in 1989, when the department became the first in the world to offer a doctoral degree in the field. Occupational science focuses on the critical role of daily activities in promoting health and a sense of well-being in our lives. “What we do every day, over our lifetime, has powerful effects on our health and eventually determines whether we can live alone in old age or whether we become dependent,” Clark said. Clark points to ordinary activities such as walking at a shopping center, exploring one’s neighborhood or tending plants as examples of ways to keep the physical body engaged and healthy. Activities like playing cards with friends or reading novels may help maintain mental acuity. These “occupations” also provide us with a sense of meaning and purpose in life, Clark said. For example, one elderly woman enrolled in the study feared falling when making the first step up onto a bus. This fear kept her from venturing far from home and led to depression. The occupational therapist assigned to this woman helped her to confront the fear by creating a practice “bus step” in her apartment. The therapist also helped the woman take a journey on the bus, which gave her the confidence to regularly initiate her own trips. As a result, she felt much better about her life and experienced a new zest for living. Because of the massive increase in the number of elderly Americans projected for the early 21st century, the widespread application of preventive occupational therapy has the potential to benefit society tremendously. Previously, health professionals have been reluctant to target older adults in preventive programs, assuming the elderly wouldn’t benefit from treatment. But Clark and colleagues say their research demonstrates that preventive programs designed for older adults can be effective.